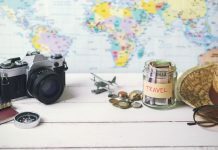 Usually, I plan my International trips in advance as this allows me to prepare a decent budget and itinerary to explore. However, Sri Lanka was different for me because I booked the flight tickets just 30 days before my departure. But surprisingly, the trip turned out to be a lot of fun and I didn’t end up spending a fortune. And yes, I was able to complete my 15 days trip on this tropical island in just 35,000 INR (including flights). 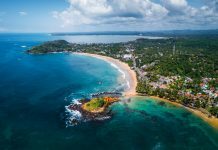 If you are also planning a trip to Sri Lanka soon, then here is everything that you need to know to make it happen. 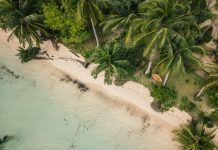 The first thing that I did when planning my trip to Sri Lanka was to look at affordable flights from Hyderabad/Chennai as I was working in Hyderabad. Luckily for me, I found a return trip flight from Chennai for approximately 12,000 INR so I booked that. So, make sure that you look for the flights before and try choosing Chennai/Bengaluru as your departure point because you would get cheaper deals from there. Once I was done with the flights, I applied for the E-Visa which cost me about 1200 INR. The best thing about the Sri Lanka E-Visa is that it takes barely 10-15 minutes to get your visa approved. All you have to do is go to the Sri Lankan E-Visa website, fill out the form, make the payment, and wait. And you will have an approved visa to enter this island nation. 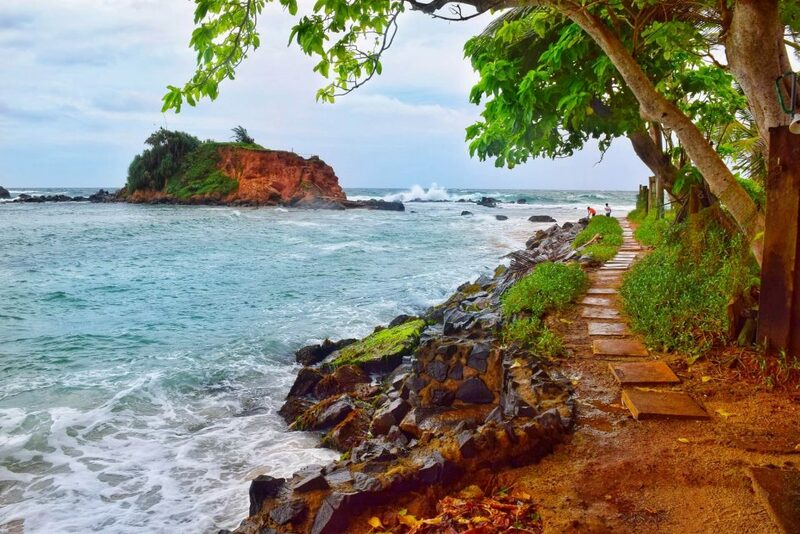 Ideally, the best time to visit Sri Lanka is in winters i.e., from November to February. However, this is also the peak season so I usually avoid going at such time. So, I planned my trip for October instead which was the post-monsoon season in Sri Lanka. As a result, I was able to enjoy the lush greenery which surrounded this place. However, if you are interested in whale watching and spending more time on the beaches of the Southern coast of Sri Lanka then between November and March is the best time to visit. Sri Lanka has a great public transportation network so you can easily travel on a budget here. During my 15 days stay here, I mainly travelled via buses and trains and it helped me save a lot of money and connect with the locals better. 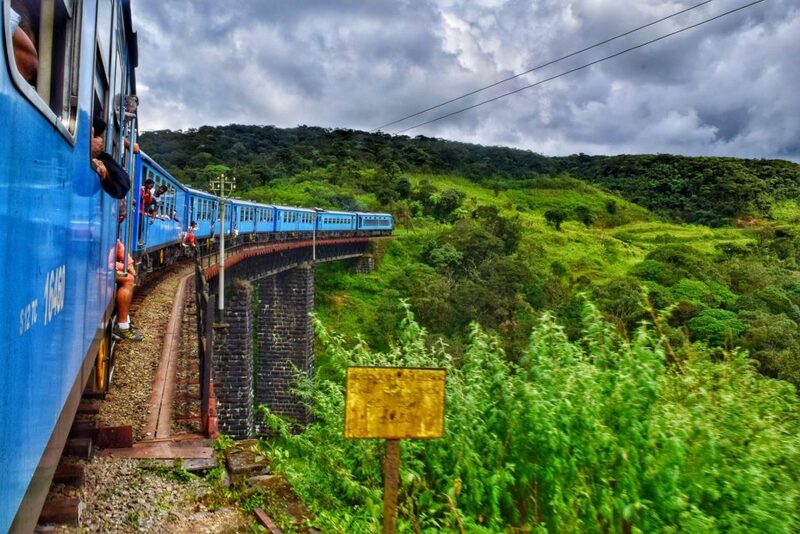 With a great and elaborate train network, you can travel to most of the Northern and Central cities of Sri Lanka via train. And since Sri Lanka is relatively a small island nation, it takes just 4-5 hours to usually cover the distance between major cities like Colombo and Kandy, Kandy and Nuwara Eliya, and so on. Also, the best thing about these trains is that they are cheap and cost you barely 150 – 300 INR for a journey. And you get to witness some beautiful landscapes on the way. In fact, the train ride to Ella was definitely one of the highlights of my trip and is a must-do activity for anyone visiting this country. While trains are good and fast, the Southern coast and some Eastern coastal cities of Sri Lanka don’t have railway connection. So, the most convenient and budget-friendly method of reaching these places is by taking a bus. I took a bus to travel from Kandy to Sigiriya and opted for a bus when going to the Southern towns like Mirissa, Unawatuna, etc. Usually, a long journey bus ride will cost you approximately 200 – 300 INR and can take anywhere between 5 to 6 hours. Finally, there are cabs and taxis that you can hire but these are usually expensive so I avoided them. However, if you don’t mind spending a little money then you can get a cab to explore the city. Taking an Auto is also a good way to travel within a city but you have to be really good at bargaining. Initially, they will quote you triple the price of the actual journey so it is important that you don’t agree too soon. I spent the following number of days at each of the places to explore the city well. In case you are planning to take the same route, here is the detailed list of things activities and places that I covered at each location. I started my journey from Colombo, which is the capital of Sri Lanka, and spent two days here, relaxing and exploring the city. On the first day, I reached late in the afternoon so I simply explored the area around my hostel. But the next day, I took a walk from my hostel to the Viharamahadevi Walk which was around 2 km away. I just strolled around this huge, green park and noticed how the local families spent time here. Then, I took a bus to Wellawatta Beach which cost me about 15 INR. There is a railway line next to the beach and the beach itself isn’t a touristy place. So, I settled here for a while to observe a gorgeous sunset. Once the sun had set, I took a bus to Galle Face and then had a delicious Chicken Kottu at the famous Nana Restaurant. The food was spicy but delicious and could easily suffice for two people. There are also a few happening nightclubs in Colombo that you can check out if you like partying. And there are a few museums and temples as well that you can explore here if you like. After spending two days in Colombo, I headed to Kandy city in a train. Kandy is nestled between the hills and is one of the largest cities in the central region of Sri Lanka. 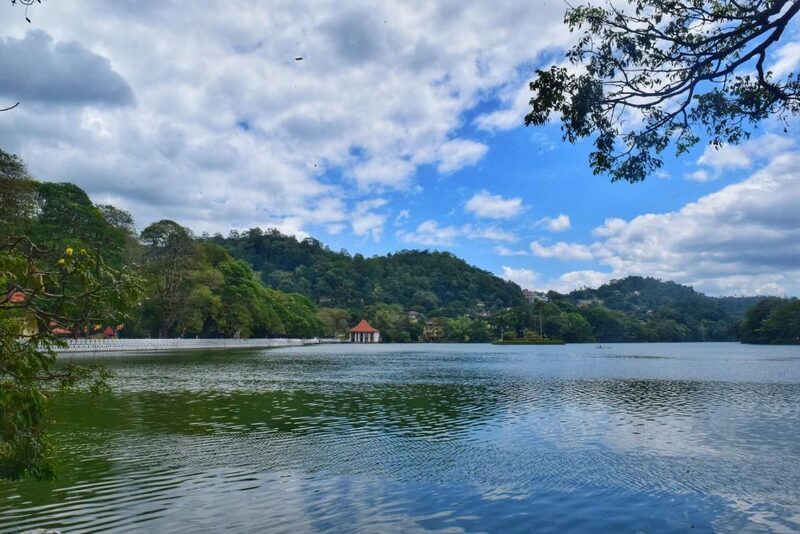 One of the best places that you can visit here is the Temple of the Tooth which is situated just beside the beautiful Kandy Lake. This lake is really peaceful so I spent a couple of hours, strolling around and enjoying the hilly views around me. From the lake, I walked to the Kandy Lake Viewpoint which gave me a panoramic view of the entire city. Another place that I loved was the Udawattakele Forest Reserve, where I had some beautiful viewpoints and trails to enjoy. 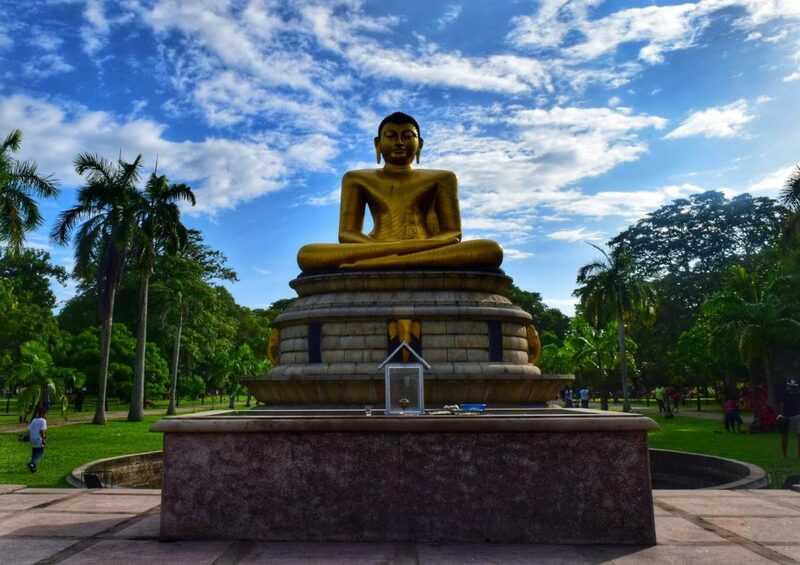 Kandy is a peaceful and calm city and has many amazing temples to explore so make the most of your time here. Make sure you carry your passport when visiting the Temple of the Tooth as the citizens of SAARC countries get a 50% discount on the entry ticket. 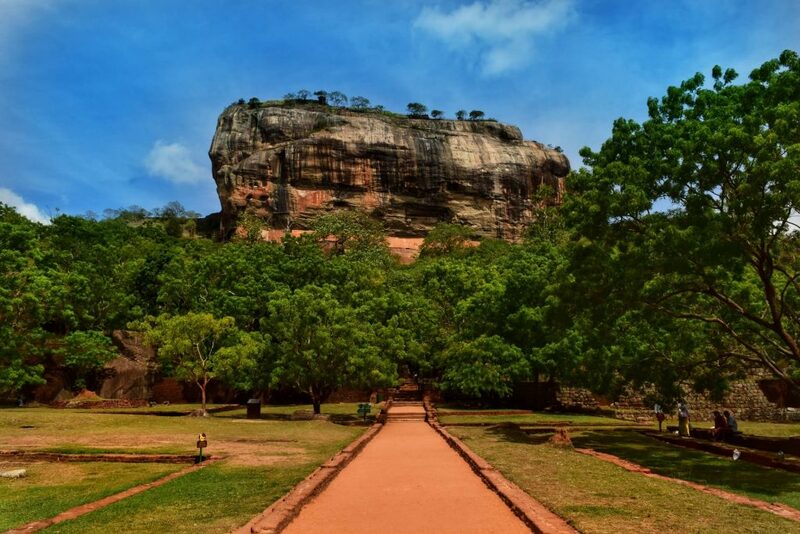 Another amazing place that I would definitely suggest you visit is Sigiriya which is an ancient rock fortress in central Sri Lanka. This place has a historical and archaeological significance so it is definitely a must-visit place. I took a bus from Kandy to Sigiriya which took about 2 hours and then spent an entire day here. There is a museum here too which explains the history of this place and the importance behind its construction. After exploring the museum, I hiked to the top of the Sigiriya rock which took about 1.5 – 2 hours. On the way, I also see some beautiful fresco paintings on the rock which still survive time and are gorgeous to look at. It takes around 5-6 hours to explore this place and in the evening, I headed back to Kandy by a bus. At Sigiriya also you get SAARC discount, so get your passport here. Unfortunately, I didn’t know this so I couldn’t take advantage of this. After Kandy, I headed to Nuwara Eliya which is known as the ‘Little England’ of Sri Lanka. This place is really gorgeous and has a colonial feel about it and you have several beautiful tea estates and gardens to explore here. 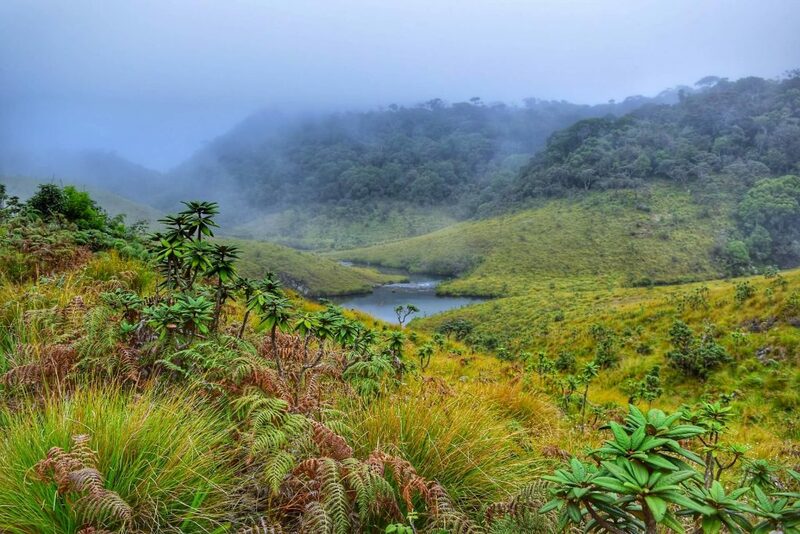 One of the most popular attractions here is the Horton Plains National Park which can take at least 6-7 hours of your time. The park can be reached only via a rented cab or auto so I had to take an auto for my return trip which cost me about 3000 INR. After reaching the park, I had to do a 10-km circuit to see all the viewpoints here like the World’s End Point, Baker’s Fall, and the Little World’s End Point. It is usually misty but I was lucky so after waiting for 5 minutes at the World’s End Point, the mist cleared and I could admire the valley in front of me. In the late afternoon, I started my way back to the Nuwara Eliya City and spent some time exploring on foot here. Next, I headed to Ella, the popular hill station in Sri Lanka. And I opted for a train journey as it is one of the most popular activities to do in Sri Lanka. It was a 4-5 hour journey and on the way, I noticed so many beautiful houses, forest areas, and tea plantations. After reaching Ella, I explored the city on foot and admired the beautiful valley that one could see from here. Although I wished to go on the Adam’s Peak and Nine Arches Bridge, I wasn’t able to do so because it was continuously raining at that time. So, I mostly hung out at the cafes here and explored places like Ravana Waterfalls, Ravana Caves, etc. when it wasn’t raining. Mirissa is a quiet beach town so there wasn’t a lot to do here. So, I mostly spent the time on the beach and also explored the private lighthouse here. This is the perfect place to relax and visit the nearby coastal villages like Midigama, Ahangama, etc. So, I took a bus from Mirissa and explored the nearby beaches and fisheries to this place. The bus ticket cost me just 40-50 INR every time. I took a bus from Mirissa to find a good Scuba Diving school in Unawatuna. Once I did that, I decided to spend some time relaxing on the beach here and then made my way to the famous Blow Hole here. The Blow Hole was deserted but it was absolutely gorgeous so I spent an hour here. Then, I made my way to the secluded Jungle Beach which is another popular beach in Unawatuna. At the Jungle Beach, I just sat down and relaxed and watched the sun go down. And the hike to the Jungle Beach itself was quite thrilling and exciting as I had to climb between the tree roots to make my way to the beach. On my second day, I just spent my time learning how to Scuba Dive and actually did it. They first taught me about the equipment that I would be using and then took me to shallow waters to practice breathing and cleaning. Once I was ready, we went to the actual Diving spot and I was able to explore a shipwreck inside the ocean too. Honestly, it was an exciting experience and the best thing is that Diving in Sri Lanka is cheap. So, I spent just 4000 INR on my Scuba Diving session here. Next, I spent two days exploring the Galle Fort as it was huge and had so much to offer. Built in 1958 by Portuguese, there is also a beautiful lighthouse here which I admired. And the streets and the buildings have a Portuguese-styled architecture so it felt like I am in a European country. I absolutely loved my time in this UNESCO Heritage Site and also tried the food at a couple of restaurant and cafes here. 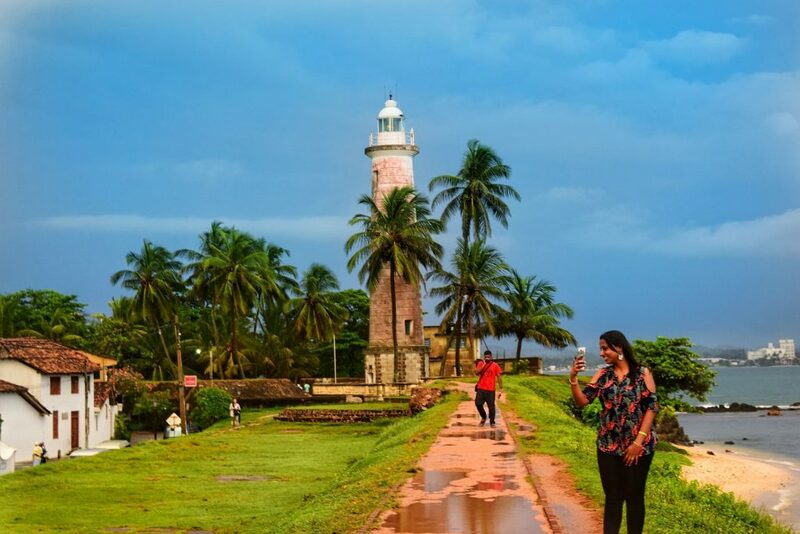 You can spend time walking around the fort and the important key points and can get lots of photos clicked here. Trust me, this is one of the best places in Sri Lanka if you want to feel like you are in a different continent. Sri Lanka is a popular backpacker destination so there are hostels, hotels, Airbnb, etc. in every city/town. But I ended up saving a lot of money by avoiding booking these accommodation places and instead opted for Couchsurfing. Couchsurfing is an app/website where you can search for natives/travellers who are living in a destination. And you can request them to let you stay at their place for free. Yes, you heard me right, it’s free! People do this in order to meet travellers and learn more about each other’s culture and stories. It was my first time trying Couchsurfing so I was a little nervous but it turned out to be a really great experience. I met so many amazing people on the way and learned so much about their unique life and travels. And as a bonus, I ended up saving a lot on my accommodation. There were a couple of places where I didn’t find a Couchsurfing host so I opted for a hostel instead. A decent hostel cost me around 500 – 600 INR per night and included a delicious breakfast as well. You will find a lot of hostels all over Sri Lanka so you can look for them when planning a trip. In terms of food, Sri Lanka is similar to India, majorly Kerala, and offers spicy and delicious dishes to taste. Here, a decent and filling meal will cost you about 100-150 INR. You will get Thalis, Rice dishes, Kottu, etc. which are a must try. There are several street vendors and small food establishments where you will be able to taste an authentic Sri Lankan meal for 100-150 INR. So, make sure you try it out. I hope this helps you plan your own wonderful trip to Sri Lanka. Check out this video for all the wonderful cultural and heritage offerings that Sri Lanka.